Q I know you’re familiar with the case in Arizona of the mother, Guadalupe Garcia de Rayos. Is she a threat to this country? MR. SPICER: You’re right, and I understand. Someone can be a threat without endangering public safety. This deported Mexican national was one of many threats to a national identity system we depend on. We condemn the exploits of foreign hackers every day, but when it comes to identity fraud from illegal aliens we argue over the morality of punishment. The media was aghast and politicians expressed outrage when Ms. de Rayos was removed. The exchange at the press conference confirms just how abnormal the rhetoric is. Are we OK with excusing identity fraud if the perpetrators are not a violent threat and only harm the security of our Social Security numbers? The reaction to de Rayos’ removal argues yes. In time, that answer will change for those who discover that someone else claimed their tax refund or took out credit cards in their name. Refund fraud and SSN theft are old problems made worse by our ridiculously distorted views on fairness for immigrants. We tolerate illegal aliens working in the U.S., tell them they are essential because of the menial tasks they perform, guarantee them worker protections meant for citizens, and then complain when our identities are stolen. That was fifteen years ago. We still don’t hear the message. IRS attacks refund fraud. We pay the bill. Does this make sense? Offering ITINs sends the wrong message. Luckily for those who don’t want to confront officialdom there is no shortage of identity factories and fraudulent SSNs. We are warned about refund fraud and identity theft. We hear about the tax gap and how much revenue is not collected. Every so often there is a showy prosecution of someone with too much money who cheated us out of a boatload of cash. Meanwhile, illegal immigrants keep working. Identity mills crank out their fake documents. Refund, employment, and other types of fraud persist. Government officials who want to crack down on the problem are criticized for being racist and xenophobic. That’s a good reason to worry and to wonder: how many versions of you are out there? UPDATE April 9, 2017: had enough fraud yet? Improper IRS payments still sap billions in tax revenue. Inspector General testimony on Tax Day revealed that $24.9 billion in bad payments were sent out in 2017 including $7.4 billion15 thanks to the illegal immigrant-friendly Additional Child Tax Credit. Republicans beat Sanchez to the punch. Republican tax reform raised the Child Tax Credit from $1,000 to $2,000 per child. Even better, it strengthened refund fraud protection by requiring applicants to have a valid SSN. As Republican Congressmen Luke Messer (R-IN) and Drew Ferguson (R-GA) point out, a 20-year old loophole from the Clinton-era 1997 Taxpayer Relief Act allowed an individual to claim the credit with only an ITIN number, which is issued regardless of immigration status. With tax reform that changed and only valid SSNs are accepted. This is great news for taxpayers and bad news for people who game the system. Here’s some more good news: our national unemployment rate is 3.9%. That should make those additional children a lot more affordable unless, of course, you aren’t eligible to be working. While Democrats vent their anger about alleged ICE cruelty towards illegal immigrants the agency is busy making sure that your secure identity stays that way. The news releases keep coming while congressional Democrats bang the drum for illegal residents and demand that ICE be abolished. Keep that in mind next time you check your credit report and can’t figure out where that new charge account you didn’t open came from. There hasn’t been much fanfare for the bill. Sen. Jones was the only cosponsor. H.R. 4089, the House version, had no cosponsors. The problem with this kind of legislation is that human nature is likely to take over. Taxpayers who haven’t been hit with identity theft will trust the government to protect their sacred SSNs. Making the PINs optional means many, if not most people are not going to use them. A lot can happen during the five-year phase in if the government decides to make the PINs mandatory, especially if Republicans lose out in Congress and liberal immigration policies including eliminating ICE replace the rule of law. Thieves are clever and they keep coming up with new ways to cheat us out of our money. Hurricane Florence was a disaster for many, but for some it was also a way to get into our wallets. The agency reports that phony charities, fake websites, and individuals impersonating IRS personnel “to help victims file casualty loss claims and get tax refunds”23 sprung up in the wake of the disaster. For midterm candidates looking for that elusive red herring, how about wrapping your arms around this one? Penalties should be severe for those who profit from disaster. As far as the Honduran tax thief is concerned, he was sentenced to prison and three years of supervised relief. Why? Just kick him out. How this plays out remains to be seen. It’s very difficult to separate partisan fear mongering from the truth. What we do know for certain is that tax refund and SSN fraud will continue unabated as the new filing season presents more opportunities to steal money from taxpayers and the government. Ironically the current shutdown is all about illegal immigration, a big problem that puts your Social Security Number at risk. Where do these calls come from? The article didn’t say, but rest assured U.S. currency is good just about anywhere on earth. 1. “Press Briefing by Press Secretary Sean Spicer, 2/21/2017, #13.” The White House. February 21, 2017. https://www.whitehouse.gov/the-press-office/2017/02/21/press-briefing-press-secretary-sean-spicer-2212017-13, retrieved March 14, 2017. 2. “Over 100 Defendants Charged in Government Impersonation, Fraud, and Theft Schemes Involving Tens of Thousands of Stolen Personal Identities.” The United States Attorney’s Office. Southern District of Florida. January 31, 2017. https://www.justice.gov/usao-sdfl/pr/over-100-defendants-charged-government-impersonation-fraud-and-theft-schemes-involving, retrieved March 21, 2017. 3. “Identity Fraud. Prevalence and Links to Alien Illegal Activities.” United States General Accounting Office. June 25, 2002. p. 12. 5. “Efforts Continue to Result in Improved Identification of Fraudulent Tax Returns Involving Identity Theft; However Accuracy of Measures Needs Improvement.” Treasury Inspector General for Tax Administration. February 9, 2017. https://www.treasury.gov/tigta/press/press_tigta-2017-01.htm, retrieved March 14, 2017. 6. “Efforts Are Resulting in the Improved Identification of Fraudulent Tax Returns Involving Identity Theft.” Treasury Inspector General for Tax Administration. April 24, 2015. https://www.treasury.gov/tigta/auditreports/2015reports/201540026fr.html, retrieved March 14, 2017. 7. “Press Briefing by Press Secretary Sean Spicer, 2/21/2017, #13.” Op. cit. 8. “Missouri Man Indicted for $12 Million Tax Refund Fraud, Voter Fraud, Illegal Reentry and Felon in Possession of Firearm.” The United States Department of Justice. March 29, 2017. https://www.justice.gov/opa/pr/missouri-man-indicted-12-million-tax-refund-fraud-voter-fraud-illegal-reentry-and-felon, retrieved April 9, 2017. 10. “Louisiana Tax Return Preparer Sentenced to Jail for Stolen Identity Tax Refund Fraud.” Department of Justice. Office of Public Affairs. May 2, 2018. https://www.justice.gov/opa/pr/louisiana-tax-return-preparer-sentenced-jail-stolen-identity-tax-refund-fraud, retrieved May 4, 2018. 12. “Continued Oversight of the Internal Revenue Service.” Testimony of The Honorable J. Russell George, Treasury Inspector General for Tax Administration. Joint Hearing Before the Committee on Oversight and Government Reform, Subcommittee on Health Care, Benefits and Administrative Rules and Subcommittee on Government Operations U.S. House of Representatives. April 17, 2018. p. 1. https://www.treasury.gov/tigta/congress/congress_04172018.pdf, retrieved May 4, 2018. 16. “Linda Sanchez Introduces Amendment to Restore and Expand Child Tax Credit.” Linda Sanchez. November 7, 2017. https://lindasanchez.house.gov/media-center/press-releases/linda-s-nchez-introduces-amendment-restore-and-expand-child-tax-credit, retrieved May 5, 2018. 17. “Rep. Messer Pushes to Eliminate Tax Credits for Illegal Immigrants.” Luke Messer. October 4, 2017. https://messer.house.gov/news/documentsingle.aspx?DocumentID=647, retrieved May 5, 2018. 18. 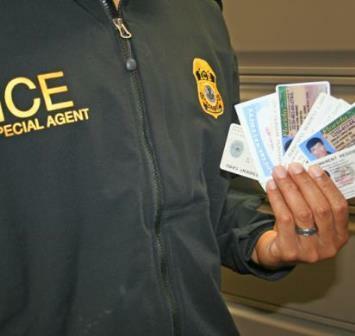 “ICE HSI Boston, Attorney General announce 25 arrests in large-scale document and benefit fraud scheme.” U.S. Immigration and Customs Enforcement. July 23, 2018. https://www.ice.gov/news/releases/ice-hsi-boston-attorney-general-announce-25-arrests-large-scale-document-and-benefit, retrieved August 4, 2018. 19. 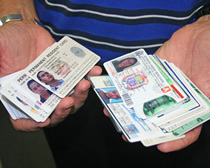 “Dominican national pleads guilty to role in national conspiracy to sell US identity documents to illegal aliens.” U.S. Immigration and Customs Enforcement. February 20, 2018. https://www.ice.gov/news/releases/dominican-national-pleads-guilty-role-national-conspiracy-sell-us-identity-documents, retrieved August 4, 2018. 20. “Senators Collins, Jones Introduce Bill to Prevent American Taxpayers and Seniors from Falling Victim to Identity Theft.” Susan Collins. July 13, 2018. https://www.collins.senate.gov/newsroom/senators-collins-jones-introduce-bill-prevent-american-taxpayers-and-seniors-falling-victim, retrieved August 4, 2018. 21. “Foreign National Sentenced to Prison for His Role in Stolen Identity Refund Fraud Scheme.” The United States Department of Justice. September 19, 2018. https://www.justice.gov/opa/pr/foreign-national-sentenced-prison-his-role-stolen-identity-refund-fraud-scheme, retrieved September 23, 2018. 22. “Despite Major Progress, Identity Theft Still on IRS ‘Dirty Dozen’ Tax Scams List.” IRS. March 7, 2018. https://www.irs.gov/newsroom/despite-major-progress-identity-theft-still-on-irs-dirty-dozen-tax-scams-list, retrieved September 23, 2018. 23. “IRS warns of scams related to natural disasters.” IRS. September 18, 2018. https://www.irs.gov/newsroom/irs-warns-of-scams-related-to-natural-disasters, retrieved September 23, 2018. 24. “IRS Operations During the Appropriations Lapse.” IRS. https://www.irs.gov/newsroom/irs-operations-during-the-appropriations-lapse, retrieved January 21, 2019. 26. “Warner, Kane Press Trump Administration on How Government Shutdown Will Impact Tax Refunds for Virginians.” Tim Kaine. January 7, 2019. https://www.kaine.senate.gov/press-releases/warner-kaine-press-trump-administration-on-how-government-shutdown-will-impact-tax-refunds-for-virginians, retrieved January 21, 2019. 27. Borland, Jim. “Beware of Scammers Pretending to be Social Security.” SSA.gov. January 17, 2019. https://blog.ssa.gov/beware-of-scammers-pretending-to-be-social-security/, retrieved January 21, 2019. Photos: “TOP STORY: ICE HIS investigation uncovers Florida document fraud operation.” U.S. Immigration and Customs Enforcement. July 21, 2011. https://www.ice.gov/news/releases/top-story-ice-hsi-investigation-uncovers-florida-document-fraud-operation, retrieved March 21, 2017.